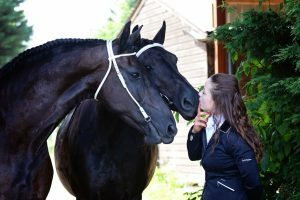 Clare Gangadeen, Saddle Fitter for Berkshire, Hampshire and Oxfordshire and her “Girls” Friesians, Rana and Annick. Horses have been a large part of my life since the age of about 10 and was lucky enough to have my first pony at the age of 13. My dad used to drop me off during the summer holidays at 6am and pick me up at 6pm and although the days we long and sometimes wet and chilly, the time always seemed to pass so quickly. Tammy a 5year old New Forest mare was my best friend but I sadly lost her when I was 15, to acorn poisoning. The experience of losing Tammy, in honesty, broke me. I continued to be involved with horses, mainly training of youngsters and had many shares or loans but couldn’t really face owning again. In 2005 I became quite ill, which caused me to reflect on life and I decided that I wanted a horse, a black one! Just like Black Beauty (every girls dream, no?) I searched and came across Rana, a Friesian (never heard of the breed before), I fell in love with her picture and one week later she arrived from Holland at 14 months old. Rana has tested me to the end of the earth and back and there were times I would just break down (Babies! Who would have them!) but, today, she is the most amazing horse, I trust her with my life and I am so very lucky that she found me (all horses come to us for reasons). I fell in love with the breed, nothing I had ever experienced before so, obviously, I brought another (you can never have just 1 Friesian!) I purchased Annick from the same people as Rana but from the point of sale, it was nothing but problems. When she arrived, aged 5, I felt my heart break. She was in such a bad state and was extremely scared and anxious. I spent much time and money in getting her to where she should be but unfortunately, whilst trying a back protector (first one I had worn in over 15 years!) on my Albion Dressage saddle, a tag flapped in the wind and she took off in the school, the saddle slipped which caused her to buck and I ended up on the floor and being clipped in the head by her hind hoof. I remember looking at her from the floor struggling to breathe, she was just so scared….I got back on (as you do!) and walked round but I was just too scared to ride her again. She was sent for training, to teach her she can look and react, but not run, they did a brilliant job and about 4 months later I started to ride her again (in full amour and being led). Although the saddle fitted her well, it did not fit me at all, I had never felt safe and even less so since the incident. I contacted Dean and Gini and explained where I was at and that I needed to feel safe and secure, if I couldn’t, I may have to part with Annick. 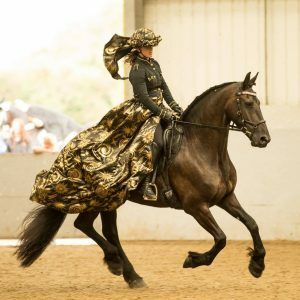 They arrived and provided me with a Reactor Panel Dressage Saddle, the panels on the saddle moved with Annick’s huge movement but I felt safe….something I had never felt with Annick. This saddle changed everything….as time went on, I felt more and more confident and our bond built and today, Annick would do anything for me as I would for her….I can honestly say that if I hadn’t contacted Dean and Gini, Annick and I would not be together today. These girls are my life and I am so happy to be working as a Saddle Exchange Agent, and look forward to changing riders lives like it changed mine. Clare is now our agent for Berkshire, Oxfordshire and Hampshire, if you would like to contact Clare about saddle fitting or personal training for yourself and your horse please see her agent page. or connect with her on facebook.